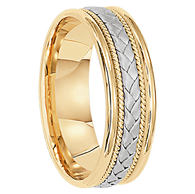 At Mens Wedding Bands, we carry top of the line, exclusive, name brand rings from the largest and most respected companies in the United States. All finished pieces are designed and handcrafted from the finest materials to ensure a lifetime of enjoyment! Recognized for one of the largest inventories on the internet, we specialize in intricately carved and meticulously handcrafted rings. We do not carry Cubic Zirconium or Hollow Gold rings. These types of rings are far less expensive to manufacture but cannot be warrantied for life due to their tendency to show wear, discolor, fade, and crack. Our lifetime warranty is known for its comprehensive coverage - including discoloration, breakage, and loss of diamonds. Minor imperfection? Return it. Don't like it? No problem, return it for a refund or a different ring! Lost a diamond? No problem - precious stones are covered for LIFE! You will be 100% satisfied! We guarantee it. Note: Handmade custom rings to order within the Exotic Inlay Collection carry a one-year warranty against defects in workmanship ... each piece is a custom, one-of-a-kind collectible ring. However, even our handmade, custom "Exotic Inlay" rings can be refurbished for life for a nominal fee. We understand that price matters; our philosophy is seeking price value instead of simply cheap prices. Shoppers can find rings for under $30.00 on a variety of online stores. Our goal is to offer top quality at reasonable discounts. Rings that will last for life and are unique, crafted by skilled craftsmen, and stunning in every detail.